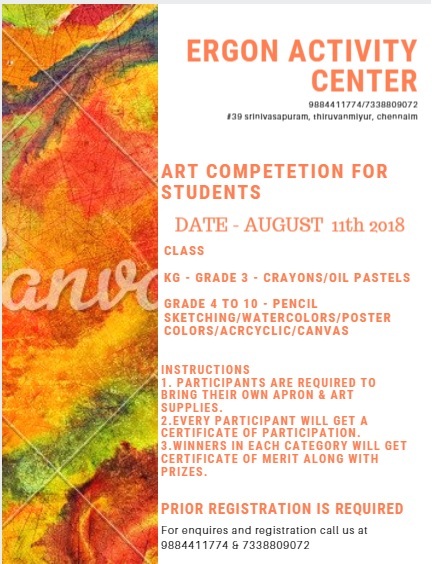 ERGON ACTIVITY CENTER Drawing Competition for Kids. 4. Grade I, II & III ( 11.30 – 12.30 PM) – Pre Printed Sheets – Oil Pastel Crayons. 5. Kindergarten ( 10.30 to 11.30 AM) – Pre – Printed colouring sheets – Crayons. · Prize Distribution : 5:30 PM Onwards. · Participants are required to bring their own apron & Art supplies. · Every participant will get a certificate of participation.
. Winners in each category will get certificate of merit along with prizes. Payments can be done on the day of the event.